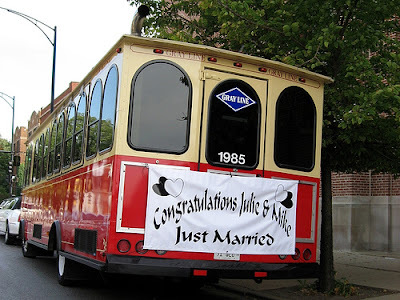 Hiring a trolley for your wedding day transport has become pretty ubiquitous in Chicago. All the knotties are talking about trolley rates, tipping your driver and whether or not to buy the "wedding decor" package which includes some tulle and a "Just Married" sign. I am usually a little hesitant to go for something that is so popular. I like to do my own thing. The basic outline of my wedding is pretty traditional, but I like to think that the little details are all my own. I had a hard time deciding on my wedding day transportation. I wanted to invite all the members of our large-ish wedding party, their dates and our parents to join us on the photo tour. I needed something to take us around for pictures before the ceremony and then take the wedding party (or whoever can fit!) from the church to the reception site. My options were a trolley, bus or some ginormous limo. The trolley sounded like the best choice, as there are all kinds of fun photos you can take both inside and outside of the trolley. Some trolley companies (including ours) will allow you to bring a cooler of snacks and beverages on board, so its pretty much a party on wheels. Woohooo! San Francisco has the real deal running day and night, but for some reason Chicago decided to create a fleet of knock-offs and I love it! Did anyone else use a (somewhat) unique method to transport their wedding party or guests around? ***As much as I enjoyed my "i heart blah blah" title naming pattern, it has really been annoying me when the posts are carried over to Weddingbee. What do you all think? you're going to laugh - but i am totally having the planner call the rome braves to see if there is a bus i can rent to take everyone to the welcome party! E- do you mean the Atlanta Braves? Will they rent you one of their buses? I just heard about someone buying those huge car magnets and sticking them to their limo... just throwing it out there!